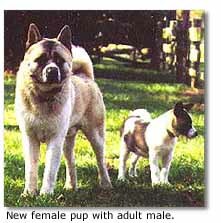 - by Jodi Marcus, Akita Rescue Mid-Atlantic Coast, inc.
Let me start with a disclaimer. I am not saying this method will work for all dogs all the time. It has worked very well for me with spayed and neutered dogs. It is easier to introduce a puppy or younger dog into a household with adults. The most important thing to remember with puppies under 6 months is that when they are with the adult dog, they must be observed at all times. Puppies do things that annoy adults and the adult will snap to teach the puppy a lesson and its place in the pack order. With a sensitive puppy, this could make him or her very fearful of the adult and cause a set back. But the basic method for introducing both puppies and adults to the household is pretty much the same. The new dog is brought into the house while the resident dog is outside. I put the new dog in a crate, which is placed in a high traffic area…a place where the family usually spends most of their time, a kitchen or family room. In this manner, the new dog can accustom itself to the rhythms, sounds and smells of the household. It is quite permissible for the resident dog to walk over and sniff at the newcomer's crate. However at the first sign of aggression, i.e., hackling, growling, posturing, they are disciplined. If the crated dog reacts aggressively, bang on the top of the crate while telling him "NO!" If that doesn't work, "earthquake" the crate…rock it back and forth from side to side while telling them "NO!". The owner must be very vigilant and very consistent in stopping signs and sounds of aggression from either dog. Do not let adult dogs meet for at least 4-6 weeks. Puppies may meet the resident in 2-3 weeks depending on the resident dog's reaction. In this time period, the resident is let out, brought in and put away somewhere such as another crate or another room. Then the new dog is let outside to run around and do his business. He comes in, gets some time in the house, and is crated again. The resident comes out and gets some special attention. Everything is done in shifts in this "getting used to each other" period. It is time consuming and can be difficult, but worth it in the long run. A little side note: feed the new dog in the crate, and make sure every time he goes in, even if he has to be shoved, to give him treat. This may help him become accustomed to being crated more quickly. With Puppies, start in the yard. One person has the resident dog on a lead, and the other has the puppy. If it is a young puppy, 4 months or under, he may run loose, but have someone available and ready to grab him at the first sign of problems. Let them sniff and interact, being very vigilant for signs of antagonism. This can go on for 10-14 days. If all is well in these sessions, let the adult off lead, but keep very close watch and stay close to them. I am loathe to leave small puppies running with big dogs…only because they can be hurt by the big dog playing, or hurt themselves by pushing too hard playing. If all goes well, move them into the house. MAKE SURE THERE IS NOTHING TO ARGUE OVER ANYWHERE. THIS MEANS BONES, TOYS, FOOD, CHEWIES, FOOD BOWLS, BLANKETS. Eventually they may be able to share some toys, but I prefer to leave those in crates. My own dogs don't mind sharing Booda -bones, but nothing else. This document is the sole property of Jodi Marcus and Akita Rescue, Mid-Atlantic Coast, Inc. | Permission is given to reproduce and distribute with proper accreditation to the author.